A day after being named the Bisons 2018 Most Valuable Player, Blue Jays catcher Danny Jansen has been given the honor as the International League's Post Season All-Star at the position. The IL announced their annual end of season awards Tuesday with Jansen becoming just the third Bisons backstop in the modern era to take home the postseason honor and the first since Einar Diaz in 1998. Joel Skinner won the award in 1985 while the Bisons played in the American Association. In 88 games with the Herd, Jansen averaged .275 (2nd on team), with 21 doubles (2nd), 12 home runs (2nd) and 58 RBI (1st). While he is currently with the Blue Jays, he also ranks fourth in the International League with a team-best .390 on-base pct. and a .473 slugging pct. He walked a team-best 44 times while only striking out on 49 occasions. Jansen represented the Bisons in the 2018 Triple-A All-Star Game and hit a home run for Team USA in the 2018 Sirius XM Future's Game. Earlier this month, he made his Major League debut for the Blue Jays and is still currently playing with Toronto. 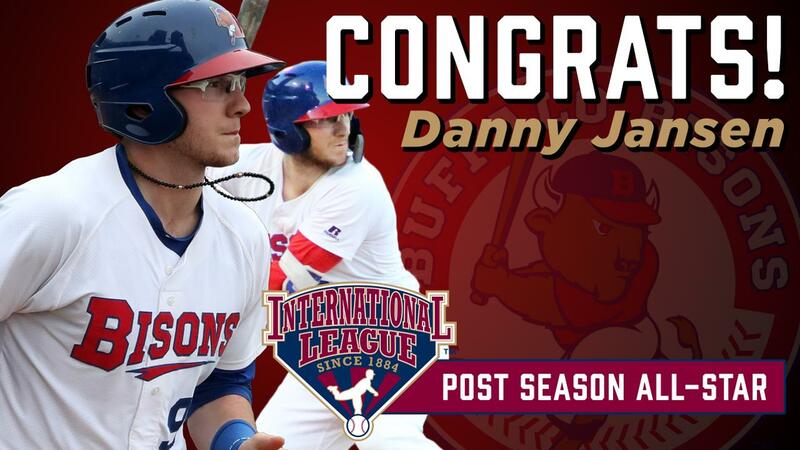 Janson is the Bisons sixth postseason All-Star during the Blue Jays affiliation that began with the 2013 season. The list includes DH Mauro Gomez (2013), OF Kevin Pillar (2014), RHP Bobby Korecky (2014), 3B Matt Hague (2015) and DH Jesus Montero (2016).